The Fort Garry Hotel was built by Grand Trunk Pacific Railway in 1913. 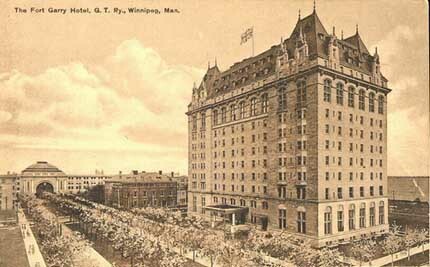 The 12-story, castle-like hotel, named for nearby Upper Fort Garry, was modeled after the Chateau Laurier in Ottawa. The hotel is noteworthy for it's ballroom and concert hall on the seventh floor. Throughout the hotel's history, there have been many alleged sightings of ghosts on it's grounds. Guests have reported of apparitions by their beds, strange sounds and even the feeling of someone crawling into their beds. The ghost of a woman who apparently committed suicide is said to haunt room 202. She has been seen, floating above the foot of the bed. This same woman is also believed to haunt the lounge, where she is said to be seen crying. It is interesting to note that most, if not all, of the hotels built by Grand Trunk Pacific Railway are allegedly haunted. Have you experienced anything unusual at the Fort Garry Hotel or elsewhere in Manitoba? Can you add any further information to this report? If so please do contact us at admin@psican.org Your privacy will be protected, and confidentiality is assured.